“39 yo female presented in cardiac arrest after being found down with needle in her arm. Multiple epinephrine and Narcan given prior to arrival with no ROSC. Resuscitation continued briefly with PEA on monitor and patient was pronounced dead.” Every week, we review all deaths in the hospital. One of our quality nurses summarizes each case in a couple of sentences. Every 2-3 weeks, there is one similar to this one from last week. The perpetrators: heroin and fentanyl. We often consider heroin abuse as a problem of modern times. But opioid use has been with us for at least 5,000 years and heroin abuse has been a plague on humanity for more than 100 years. It all started with the ancient Sumerians. They migrated from what is now Iran to settle between the Tigris and Euphrates rivers around 5,000 BC. They had one key advantage over all of the other tribes in the area, in that they learned irrigation techniques to keep their crops from dying during periods of drought. They flourished and by 3,000 BC, they had invented writing and from their writing, we can learn about what crops they grew. For example, we know that they grew barley and about 40% of it went to the brewing of beer. 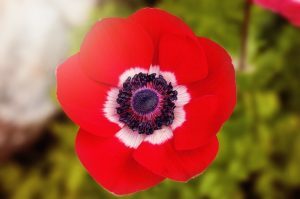 They also grew poppies that they called the “plant of joy”. By 500 BC, the secret of opium poppy cultivation spread to the Akkadians, the Assyrians, the Egyptians, and then the Greeks. Two thousand years later in 1,500 AD, Europeans had figured out that you can get a stronger effect of opium by smoking it rather than by drinking it and from this was born the opium dens. With fast and sturdy sailing ships, the Europeans were eager trade with China for spice, porcelain, and silk. But Europe needed something to take to China in return and that something was opium. In 1720, the British East India Company shipped 15 metric tons of opium to China and by 1840, that had increased to 2,555 metric tons. In 1804, morphine was first extracted from opium and it rapidly gained commercial success as an analgesic. In 1874, a chemist in London was experimenting with morphine by mixing it with various acids and he created diacetylmorphine. His work was forgotten and then in 1897, Felix Hoffman, working for the Bayer chemical company accidentally synthesized diacetylmorphine when he was trying to produce codeine. 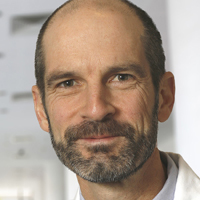 Scientists at Bayer had just invented another drug that they called aspirin and the head of Bayer decided to move forward with diacetylmorphine first because it was felt to have more commercial potential than aspirin. They called their new product heroin and said that it was 10 times more effective then codeine as a cough medicine and more effective than morphine as a pain reliever. They also pushed it as a treatment for asthma, bronchitis, and tuberculosis. In its first year, Bayer produced 1 ton of heroin. 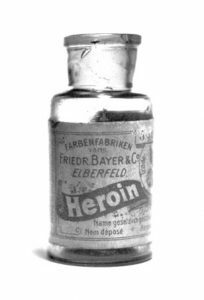 It was initially claimed to be completely non-addictive but soon there were heroin addicts world-wide and by 1913, Bayer decided to stop producing the drug. 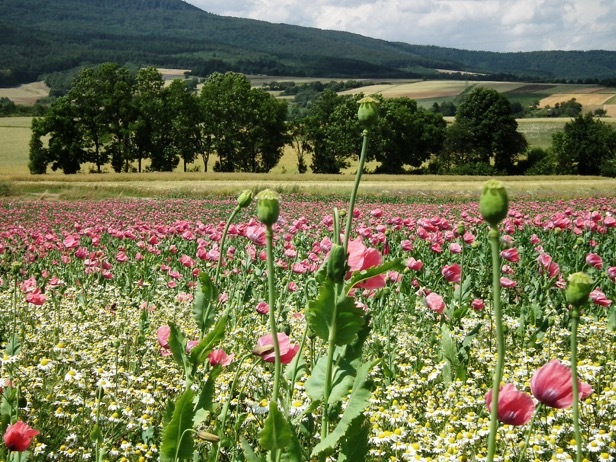 Today, 80% of the world’s heroin comes from poppies grown in Afghanistan. Here in the United States, most heroin comes from Mexico and Colombia. 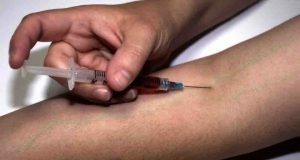 Mexican heroin production has significantly increased over the past decade, rising from 26 tons in 2013 to an estimated 70 tons in 2015. The reason for the increase is the economics of capitalism in its purest form. First, Drug cartels previously were primarily in the business of cocaine and marijuana importation but with the increase of legalized marijuana production in the United States for recreational and medicinal purposes, the demand for illegal Mexican marijuana fell significantly. Second, coincident with this was the burgeoning appetite of Americans for opioid prescription pain pills resulting in a rather dramatic increase in the American demand for opioids. With a recent nation-wide crackdown on excessive opioid prescriptions, the supply of pills dried up. The reduction in the demand for Mexican marijuana and the increase in demand for opioids resulted in a ramped up production in Mexican heroin as business shifted from cannabinoids to opioids. It is simple supply and demand – the heart of capitalism. The net effect of this is that we now have heroin available on the street that is more potent and cheaper than ever before. A single dose of heroin costs about $10-$15 dollars. In comparison, to buy a 40 mg oxycontin tablet on the street will cost about $25-$40. So, heroin is now usually cheaper than prescription pain pills when purchased illegally. As “pill mills” declined, street sales of heroin exploded. In 2014, 1 out of every 300 Americans used heroin and more than 10,000 Americans died from heroin overdose. And the number keep going up. In 2015, 1,424 Ohioans died from a heroin overdose, an increase from 1,196 in 2014. 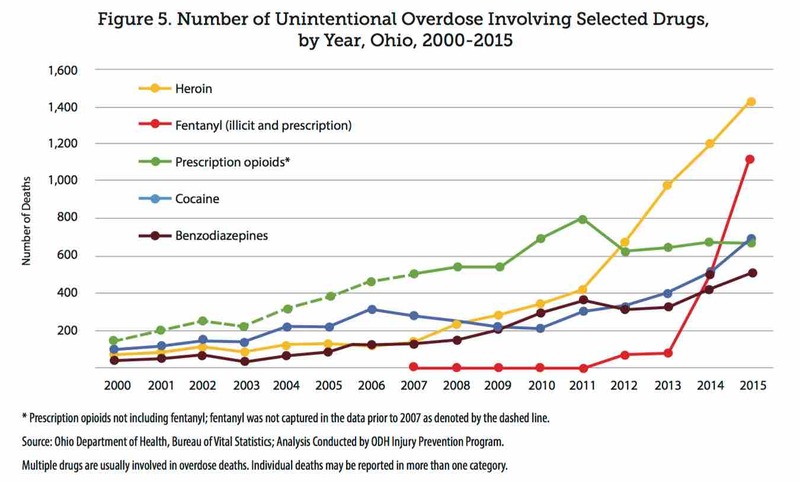 Fentanyl overdose deaths in Ohio increased from 503 in 2014 to 1,155 in 2015. 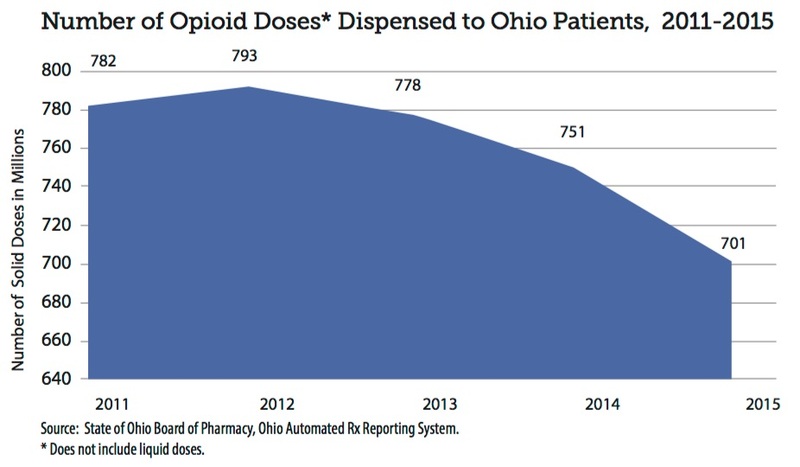 Last year, Franklin County (Columbus, OH) had 279 drug overdose deaths. Heroin and fentanyl have emerged as the top overdose killers in our state. At the same time, deaths from prescription opioids has fallen. The Sumerians didn’t die of overdoses from sipping tea made from poppies 5,000 years ago. The Europeans didn’t die from overdoses from smoking opium 300 years ago. And people didn’t die from drinking Felix Hoffman’s newly invented heroin 100 years ago. But today, we have cheap and incredibly powerful heroin and fentanyl derivatives that make it all too easy to overdose and die, for as little as $15 or $20. So, for the near future, a chief complaint of “Found down with needle in her arm” will continue to be a common first line in the emergency room chart and a common epitaph on our nation’s gravestones. Opioid deaths come down to the principles of Economics 101.